Below is a screenshot from Earnings Whisper displaying the key earnings reports to be delivered this coming week. Monday will find earnings reports from the likes of Citigroup (C) and Goldman Sachs (GS). 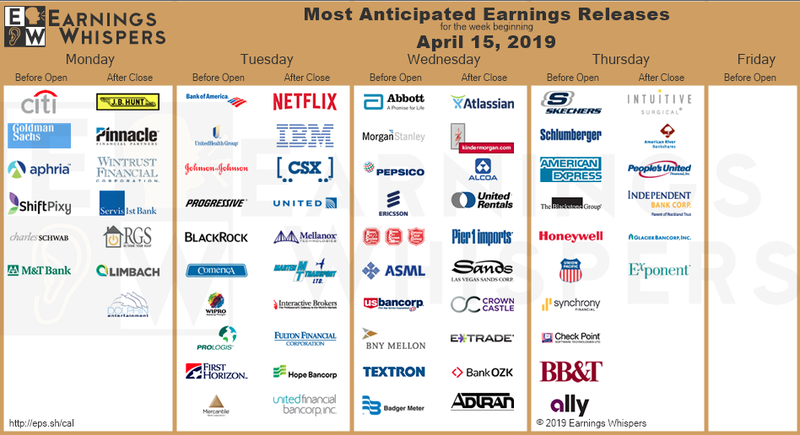 With earnings continuing to be delivered from the financial sector (XLF), investors will also receive Q1 results from outside of the sector and from the likes of Netflix, CSX Corp. (CSX), IBM (IBM) and PepsiCo (PEP). Make buybacks illegal, with a question mark and highlighting the issue of buybacks with an inverted chart… that’s the Roberts way. It aims to muddle the commentary. 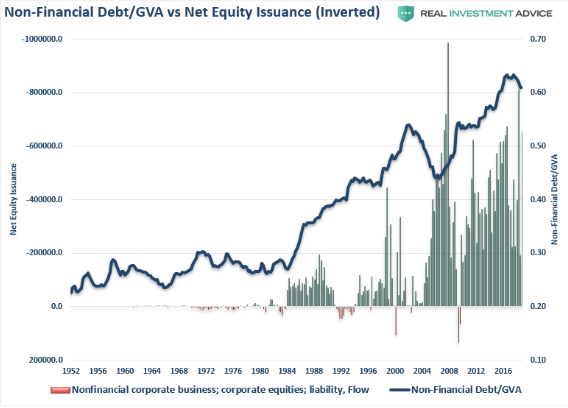 But make no mistake about it; the claim that increasing leverage/debt is being used to transact buybacks is a farce and stretching the relative time value of the equation, which has proven mostly consistent since the turn of the century. 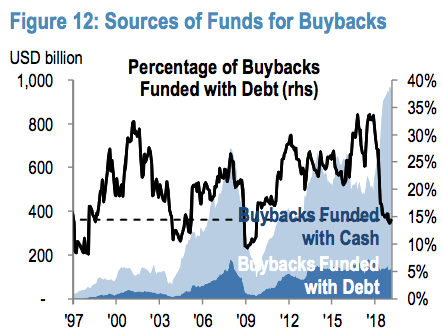 As shown in the chart above from JPM, funding buybacks with debt has been stagnant since 2012 and actually rolled over in 2018. This was a byproduct of the tax reform legislation that found corporates repatriating more cash, thus shifting the source of funding for buybacks in even greater favor of cash from debt. But also and more importantly, buybacks have always been a vast majority cash oriented exercise by corporations and debt vs. cash generated buyback ratio almost never changes, as shown in the chart. Every week is seemingly a critical week for the market when the market is expressing a V-shaped recovery. With an earnings recession in the Q1 period already expected and priced into the market, guidance will prove critical to sustain the market’s rebound. If guidance and actual Q1 results prove less than already priced in to the market, bouts of selling may find a pullback in the near future with bouts of volatility. Given the steepness of the curve and VIX futures expiration on Tuesday, the short-VOL positioning is still advantaged. 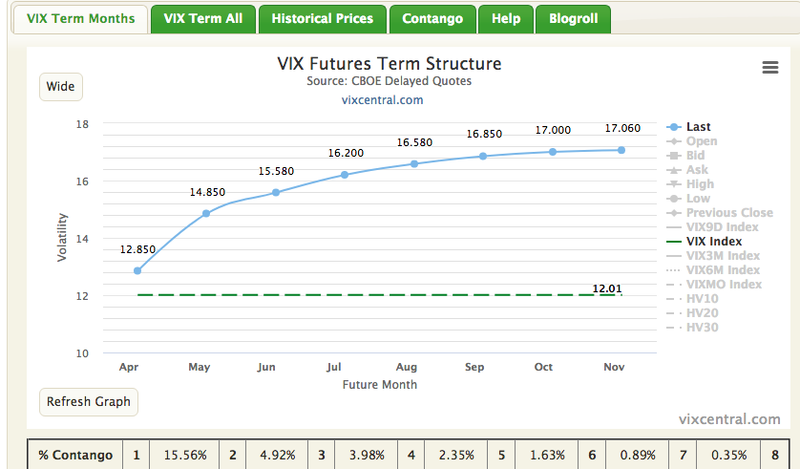 Of course, based on the VIX calendar that suggests new hedges will be placed at the start of the trading week, some of the roll yield expressed in futures term structure can be mitigated and assuming this takes place on scale come Monday. For active portfolio managers, the present risk/reward for market bulls is characterized as leaning bearish near-term, with the probability of a market pullback increasing and coinciding with bouts of increased volatility. 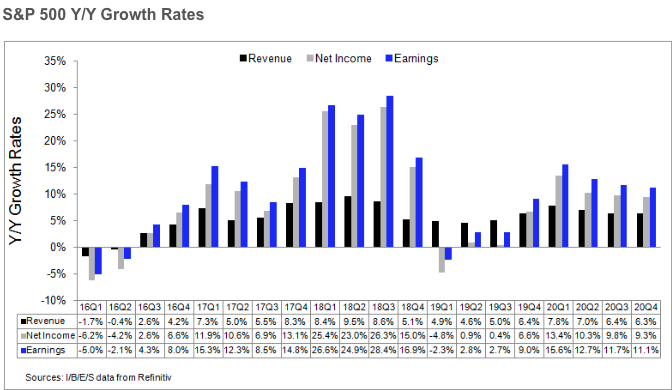 While we can’t predict how earnings season will move markets, we do believe there is an above average probability that estimates have come down too far and express excessive caution on the quarter. The market always delivers opportunity, but the opportunity can often only be realized through the preparedness of a portfolio. This begs the questions: Are you positioned to take advantage of opportunity when it is presented? Do you have cash and/or liquidity? Are you prepared to ride out potential market storms/turmoil?